"things unlucky charge my fantasy"
In Shakespeare’s day, people believed that bad dreams meant that something good was going to happen, and that pleasant dreams foretold disagreeable events. Cinna’s pleasant dream has led him to expect bad luck, so he has no desire to go outside. I dreamed last night that I was feasting with Caesar, and my dream was full of unlucky omens. I don't want to leave home, but something's drawing me out. And you had better do it truthfully. wisely I say, I am a bachelor. What is my name? Where am I going? Where do I live? Am I a married man or a bachelor? Well in order to answer every man directly and briefly, wisely and truthfully: wisely, I say, I'm a bachelor. You're saying that those who are married are fools! You'll get a hit for that insult. Go on, now answer directly. That subject is answered directly. Briefly, say where you live. Briefly, I live by the Capitol. And your name, sir, truthfully? Tear him to pieces, he's a conspirator! Truthfully, my name is Cinna. Tear him to pieces for his bad poetry, tear him to pieces for his bad poetry! but his name out of his heart, and turn him going. It doesn't matter, your name is Cinna! Just tear his name out of his heart and turn him loose then. Get him, tear him to pieces! Come, get fire! Grab some burning wood! To Brutus' house, to Cassius' house! Burn everything! Some of you go to Decius' house, and some of you go to Casca's. Some of you go to Ligarius' house! Away, go! Come, brands ho! Firebrands! 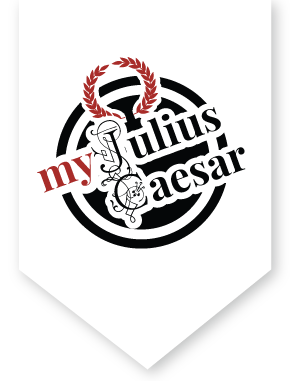 To Brutus', to Cassius’! Some to Ligarius’! Away, go!